Trump’s highly controversial decision to leave the Paris Climate Agreement was well-telegraphed throughout his campaign, but speculation that his one-time detractors the billionaire business mogul Koch brothers were behind the decision is gaining momentum. “What’s happening behind here is real politics. This is the victory paid and carried out for 20 years by two people: David and Charles Koch. That’s what this is about,” Columbia University professor and Director of the Earth Institute Jeffrey Sachs said in an interview with Bloomberg. Koch Industries and its subsidiaries are a sprawling conglomerate that comprises everything from chemicals and plastics manufacturing to energy products such as natural gas and petroleum and even fertilizer and ranching, all of which are highly polluting industries that would greatly benefit from decreased regulation and government interference. Sachs also referenced a recent letter by Republican senators to Trump, thanking him for rolling back regulations through a series of executive orders and throwing their support behind his stance on climate change. Sachs is not alone in this stance, with prominent Democratic senators expressing similar sentiments online. Democratic Senator Sheldon Whitehouse, a member of the Senate Environment Committee, pulled no punches in calling out the Koch brothers and their propaganda network in a statement posted on Twitter. While not alluding directly to the Koch brothers, Democratic Senator Patrick Leahy echoed Whitehouse’s sentiments. 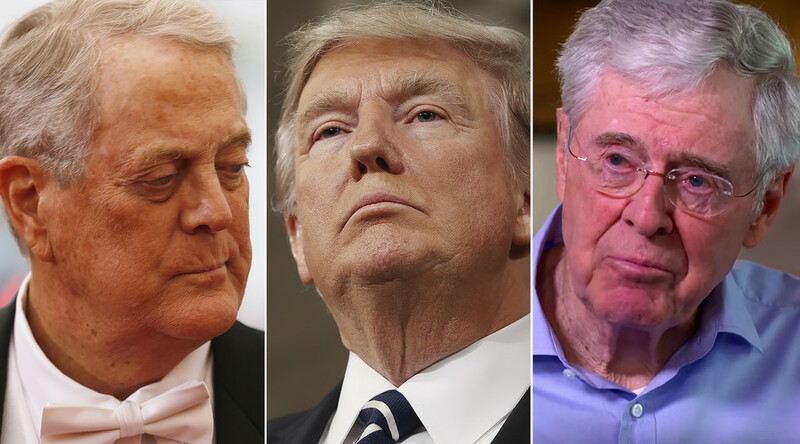 While the Koch brothers did not vocally support Trump on the election trail, it appears they have made their peace with the controversial president and his pro-business policies. “We’re principled, and if we can’t get comfortable with the policies that are in place, then we’re not going to support them,” Mark Holden, Koch Industries’s top lawyer, said previously as cited by the Washington Post. Koch Industries is the second-largest privately held company by revenue in the US, according to Forbes, and reportedly spent almost $900 million during the 2016 US presidential race through a variety of canvassing campaigns for a number of candidates. US Vice President Mike Pence, Environmental Protection Agency leader Scott Pruitt, and Marc Short, the Trump’s director of legislative affairs, all have ties to the Koch network, the Independent reports. While billionaires throwing money behind their preferred presidential candidates is nothing new, what stands out in this instance is that the Koch brothers’ sphere of influence extends far enough into another billionaire’s domain. Indeed, energy mogul and former billionaire T. Boone Pickens, a self-professed believer in climate change, applauded Trump for withdrawing from the Paris agreement. “The Paris Climate Accord is another bad deal negotiated by the Obama administration and America should applaud President Trump’s decision to exit," Pickens said in a statement published on his website. While on face value, Trump’s decision may appear to be borderline nihilistic to his critics, including a swathe of tech industry giants and former advisors who have jumped ship in the immediate aftermath, some suggest he may actually be setting up a bigger win in future. In an Op-Ed piece published by Business Insider, Matthew De Bord suggests that Trump may be opening the door for the introduction of a carbon tax, a major goal of former advisor and Tesla CEO Elon Musk and an idea Trump’s current secretary of state and former ExxonMobil CEO Rex Tillerson has previously endorsed. Time will tell how the climate agreement fiasco ultimately plays out, but Dan Merica rightly pointed out that, either way, this may ultimately end up a non-issue.